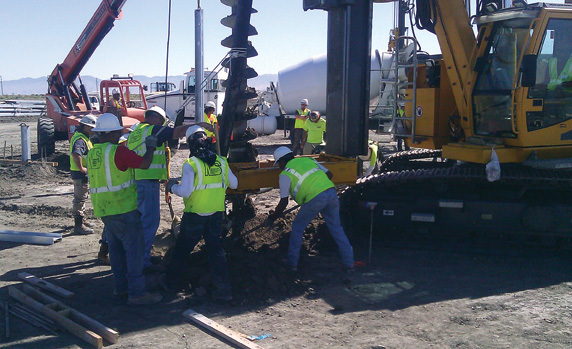 A 26 MW solar project in Nevada is proving to be a good fit with an existing geothermal facility on the same site, combining the strengths of two different renewable technologies and creating a better whole. The Stillwater renewable powergeneration plant near Fallon, Nevada, is a remarkable sight at dusk, with the sun's rays reflecting off the geothermal towers and array of solar panels stationed side by side in the Nevada desert. In May, Enel Green Power North America (EGP-NA), the American subsidiary of Italian-based Enel Group's green power investment arm, brought 26 MW of solar power production on line at the Stillwater site, about 75 miles outside of Reno. The site is now a combined renewable energy facility considering Enel Green Power began producing 33 MW of geothermal power there in 2009. EGP-NA describes this co-gen project as "the first and only hybrid power plant in the world that combines the continuous generation capacity of binary-cycle, medium-enthalphy, geothermal power with the peak capacity of solar power." The term ‘medium-enthalphy' refers to a geothermal resource with moderate temperature, below 400 degrees Fahrenheit. "Combining solar and geothermal energy is not a new concept," says Francesco Venturini, country manager of Enel Green Power North America. "Others have tried to develop it, but the only company that has been able to implement it on an industrial scale is Enel Green Power." The solar power component at Stillwater covers 240 acres. It consists of more than 89,000 polycrystalline premium photovoltaic (PV) CNPV-295P modules on fixed mounts. CNPV Solar Power SA is an integrated manufacturer of solar photovoltaic products from the production of ingots, wafers and cells to the assembly of PV modules. It also designs, manufactures and supplies crystalline solar photovoltaic modules. Racking for the project was provided by PV Hardware. The company's UtilityMax ground mount system was used on the project. 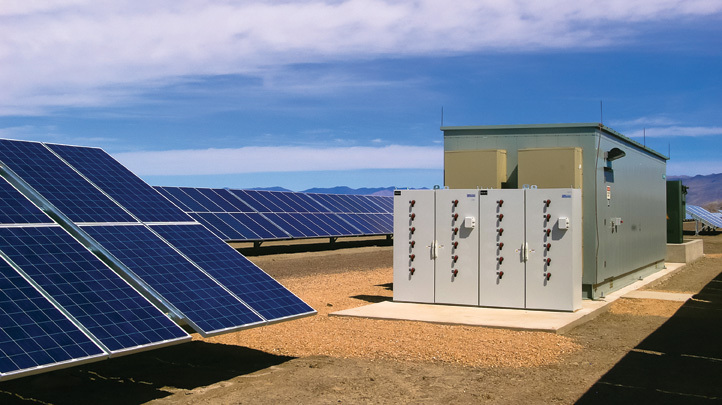 "We chose PV Hardware's UtilityMax system for this utility-scale project because it saved us considerable time and money, with minimal foundations, fast turnaround times, and bankable technology," said Chris Brooks, director of Bombard Renewable Energy, the contractor on the project. "PV Hardware exceeded our expectations in turnkey project engineering and overall ease of installing the product." UtilityMax system as ladders and lifts are unnecessary. Another distinctive feature that the company says separates UtilityMaxfrom the competition is that panel rails are not needed as modules are directly attached to structural Z-purlins per manufacturer provided mounting holes. This direct mounting method eliminates the thermal expansion and vibratory risk associated with compression clips. The construction and operation of solar power at the Stillwater project represents a significant milestone for Enel Green Power North America. Its total installed green power capacity in North America has now reached 1 gigawatt. It has renewable energy plants operating, or under construction, in 21 U.S. states and three Canadian provinces. The inverters for the Stillwater project were provided by Siemens. The power being produced at Stillwater is being sold by EGP-NA under a 20-year Power Purchase Agreement to NV Energy. Adding the solar component was something that occurred to EGP-NA after building the geothermal component. "The solar component of the Stillwater geothermal plant was not in the original design plan for the project," says Venturini. "However, it is clear that the first-ever geothermal-solar hybrid power plant demonstrates that the concept works to combine the strengths of different renewable technologies and create a better whole." He adds that the Fallon site was particularly well suited for this hybridized approach because of the abundance of both resources in the area, noting that northern Nevada has seen significant geothermal development and continues to be ripe for additional development. The Stillwater project is rather unusual in two respects. First, it combines two renewable sources of energy, one baseload and one intermittent, into a co-generation scenario. A more common co-gen approach is to attach a renewable component to a more traditional source of power generation. Second, EGP-NA is demonstrating how companies can save on installation costs by sharing infrastructure when generating two types of renewable energy on one site. The two facilities share electrical interconnection lines, control systems, fire detection and protection schemes, and the use of common operations and maintenance staff. The two power installations also support each other's auxiliary power needs, resulting in higher efficiency. "The solar plant not only sits next to the geothermal plant, it is integrated with the geothermal plant and provides the energy to run the geothermal plant's auxiliary loads," says Venturini. "Alternatively, the geothermal plant provides auxiliary power to the solar plant when there is no sunlight, thus eliminating the need for back feeding power from the utility." EGP-NA is using the binary cycle approach to generate geothermal power at Stillwater. Hot geothermal fluid and a secondary fluid (with a much lower boiling point than water) pass through a heat exchanger. Heat from the geothermal fluid causes the secondary fluid to flash to vapor, which then drives the turbines. Stillwater and its sister geothermal plant (also located near Fallon) are the only plants in the world that use large-scale submersible pumps for the extraction of the geothermal fluid. This, along with the binary cycle process, results in no loss or consumption of water and no air emissions. "Because this is a closed-loop system, virtually nothing is emitted to the atmosphere," Venturini says. "Moderate-temperature water is by far the more common geothermal resource, and most geothermal power plants in the future will be binary-cycle plants." The submersible pumps also have other advantages over line shaft pumps typically used to extract geothermal fluid. They are more environmentally friendly because they are below ground, which reduces noise and the visual impact. They also do not require oil injection for lubrication of shaft bearings. When combined with a variable frequency drive, the motor speed can be changed, which compensates for various well field conditions. EGP-NA says they are also much quicker to install, thus reducing installation cost and resulting in less downtime. The pumps can also provide geothermal production in deeper well fields and require less surface ancillary support equipment. 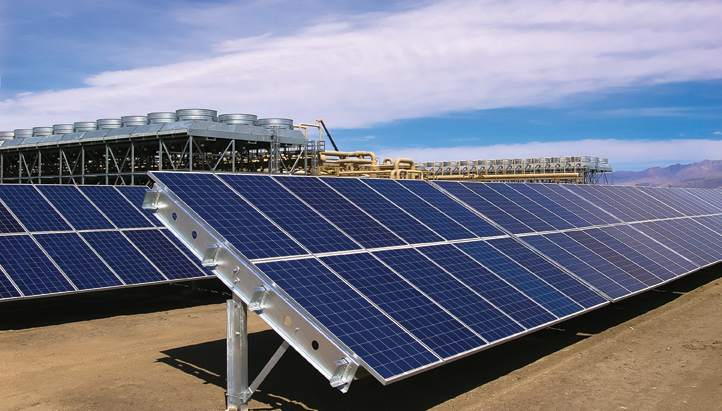 The solar component of the Stillwater project boosts power production from the site when geothermal power production is at its lowest, which is typically in the high heat of summer. EGP-NA explains that the site is already constrained by lower conversion efficiency due to the reduced temperature differential between the geothermal brine and the working fluid. A further loss is incurred during hot summer days when the high ambient temperature saps the efficiency of the geothermal cycle. This brings down the net-generation of the power plant precisely when the utility and consumers need the power most, during the warmest times of the day and year. The solar component compensates for some of that production loss. Furthermore, by adding solar production capability to its geothermal production, and given that peak solar power production typically occurs at the same time as peak demand, EGP-NA describes the combined power production capability of the site as "a more load-following production profile." The company is able to market its solar power when there is highest demand, thus earning the most potential income from this energy source. Venturini says being the first to apply this hybridized approach has had its challenges. "It has to be said that since this geothermal-solar project is a first of its kind, it met the regular challenges of everything new in terms of combining two advanced technologies, as well as challenges of a regulatory and administrative nature," he says. However, all who were involved in the process, from company engineers, to the power purchaser, to government representatives, were eager to collaborate to overcome any hurdles that had a direct bearing on the success of the project. He adds that favorable policies at both the federal and state level were critical for encouraging EGP-NA to make the investment in the first place. In describing the business climate for pursuing renewable power investments in Nevada, Venturinisays that "Nevada is certainly leading the nation in the adoption of renewable energy policy and practices." More specifically, he says that EGP-NA has found that the commitment to lead the nation in renewable energy is a sincere effort and not just lip service in Nevada. "The state has enacted policies and has the governance to meet the needs of the renewable energy business," he says. "We have been very satisfied with the business climate and opportunities for growth. What we have found most attractive is the honesty and open doors to meet with elected officials and their offices." Among the policies that the state has put in place is the goal to achieve 25 percent renewable energy production by 2025. Commissioning of solar power production at Stillwater represents a significant milestone for EGP-NA, as its total installed green power capacity on the continent has now reached 1 gigawatt. It has renewable energy plants operating, or under construction, in 21 U.S. states and three Canadian provinces, where it owns and operates 70 plants. The Enel Group is no newcomer to the renewable energy industry. It is Italy's largest power company and the second largest utility in Europe. Overall, Enel Group has installed over 7 gigawatts of renewable power production in more than 650 facilities worldwide, consisting of a mix of wind, solar, hydro, geothermal, and biomass power production. In addition to investing in the production of renewable power, the Enel Group has entered into a thin-film photovoltaic factory venture in Catania, Italy, with Sharp and ST-Microelectronics. Venturini says EGP-NA considers the hybrid option for all its renewable energy projects. The company is currently considering another hybrid, a utility-sized project in California that combines wind and solar.